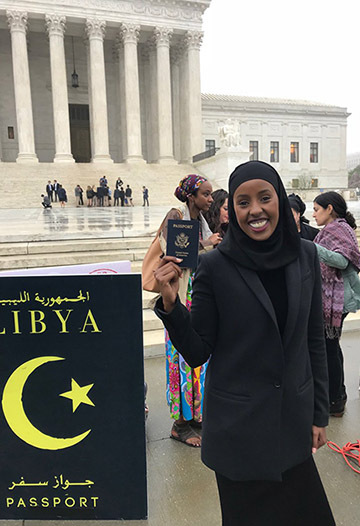 Ramla Sahid on the steps of the U.S. Supreme Court. Early in the morning late last month, while it was drizzling, cold, and still a little dark, I stood with a dozen others on the steps of this country’s highest court feeling a lot of anxiety and some hope as I waited in line to get a seat for the oral arguments in Trump’s latest Muslim ban. When we were ushered into the gallery of the Supreme Court of the United States on April 25, 2018, I sat down on an observer bench near the mid-right corner of the audience and felt the weight of that room. Sitting there, apprehensively waiting for the oral arguments in Trump v Hawaii to begin, knowing how consequential the ultimate decision would be, I reminded myself that the fight for justice and freedom is a constant, and that whatever the result, our task is to keep that fight alive. As a former refugee from Somalia, one of the banned Muslim-majority countries, my foremost thought was, “The promise of America should be open to every human being, regardless of how they pray and how they worship.” My fear, though, was that the justices might not be taking that promise into account. The presidential proclamation being reviewed by the Court that day was Trump’s latest directive on this issue, announced in September 2017, similar to his two previous executive orders that federal courts barred from being implemented because they were clearly intended to express Trump’s unconstitutional hostility to Muslims. Those Muslim bans were discriminatory and illegal because they banned entire populations of people based upon their religion (using national origin as a proxy). The September proclamation has the effect of indefinitely banning from entering the U.S. people from Iran, Libya, Somalia, Syria, and Yemen — all Muslim-majority countries — and this ban is currently in effect. Its results are broken families, deferred dreams, lack of access to life-saving medical treatment, and a perversion of American principles and values. My own family fled the civil war in Somalia when I was five years old, so I know from firsthand experience what these thousands of families, students, academics, and skilled workers are experiencing, and I can imagine what it would mean to be told that the promise of America is no longer open to you. Though given many opportunities to backtrack on that declaration, he never has, and as recently as April 30th reiterated that there was “no reason to apologize.” This statement alone undercuts Francisco’s argument that the president had disavowed his campaign rhetoric. It’s hard to predict the outcome, but I hope that the justices reject this unilateral effort to legislate unfounded fear, discrimination, and bigotry. But there is hope. Hope because I was able to be there to bear witness to this historic moment with my community of Muslim, Arab, South Asian, and African activists from all over the country, as well as allies supporting our communities’ call for religious freedom and fairness. Our presence was felt inside and outside. And the rally held outside the Supreme Court that morning replenished my energy. Yes, we are being threatened in bold ways, and our communities are under constant assault. But this hasn’t happened spontaneously. In fact, this is the reality of America for far too many of its citizens and residents. So we do what we have always done in this country. We resist. We continue to educate and politicize our people and allies, we organize, and we build a more connected and accountable multiracial movement. Ramla Sahid is executive director of Partnership for the Advancement of New Americans. This entry was posted in Uncategorized on May 8, 2018 by Richard Irwin.